Things just keep getting better for Bollywood's most bankable khiladi. You guessed it. We're talking about Akshay Kumar [Images], whose dream run last year with four hits -- Namastey London [Images], Welcome, Heyy Baby, Bhool Bhulaiyaa -- gave Shah Rukh Khan [Images] a run for his money. Also Read: Akshay is worth Rs 45 crores! And come Friday, the actor will add another feather to his cap. 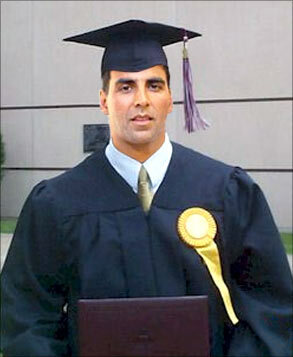 Akshay will be conferred an honourary doctorate by the University of Windsor, Ontario, Canada [Images]. The star is the latest in the line of honorary 'doctors' like MGR, NTR, Amitabh Bachchan [Images], Shilpa Shetty [Images] and Kamal Haasan [Images]. Designer Uday Kuckian imagines how Dr Akki would look on Friday.